PALISADES PARK – First United Methodist Church of Ridgefield Park was eager to grow. The congregation had a strong desire to see the church expand, earnestly seeking to reflect their extremely diverse, urban community. They faced two challenges: finance and leadership. Palisades Park is an area largely populated by Hispanic immigrant families and day-laborers. 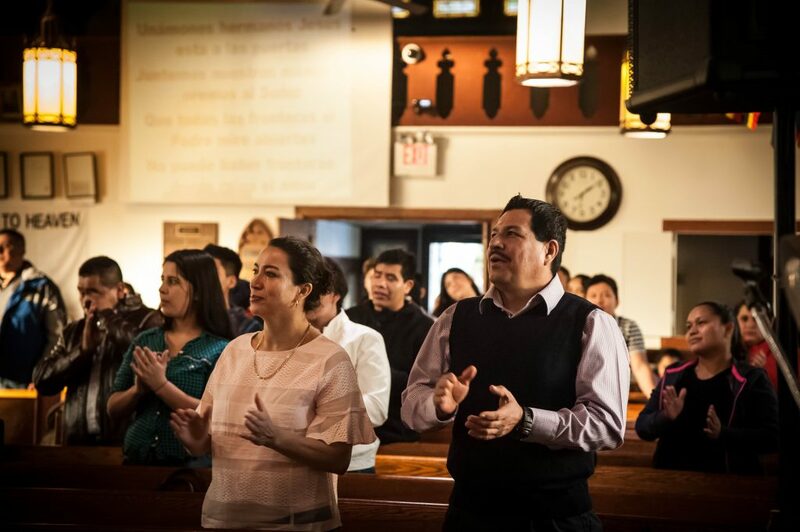 The congregation in neighboring Ridgefield Park knew that if they wanted to grow they needed to meet the needs of this population which represented over six different nationalities. The church, with the help of a GNJ grant, took its first step in 2015 by launching a weekly Saturday Hispanic worship service and small group. By January 2018, the two challenges of finance and leadership had been solved, and the church planted a second site in Palisades Park, offering two services on Sunday and Tuesday. Ryoo and the church leaders turned to the community and started asking around, looking for a pastor who would fit into their ministry. It was then that they came across Daniel Lee who had been ministering to Hispanic day laborers for years in Palisades Park, was fluent in Spanish and spent his young adult life in Argentina. He was an ordained pastor from the Christian and Missionary Alliance (C&MA). “We met and shared our vision together,” said Ryoo. “His love and compassion for people was inspiring and we decided to partner in ministry.” Since his initial involvement in 2015, Lee decided to serve the United Methodist Church and was certified and recommended as a licensed local pastor. According to Lee, 30% of Palisades Park residents are Hispanic, coming from Mexico, Guatemala, El Salvador, Honduras, Puerto Rico, The Dominican Republic, Columbia, Ecuador and Nicaragua. Lee shared that many of the area’s Hispanic teenagers left their countries to try finding a better life in the U.S. Poverty, criminal gangs, political instability and recurring financial crises often conspire to make Latin American life more challenging than the U.S.
“Hundreds of Hispanic day laborers come to our town every morning looking for a job, so we are sharing the Gospel and the love of God every Tuesday through the service and the lunch fellowship, providing workers with a warm place to gather and a good meal,” said Lee. A local community organization assists individuals who have a variety of needs, ranging from how to completing applications and forms for services and employment, finding medical services, connecting with people who have similar struggles and helping migrants adapt to life in a different culture. The local pastors and volunteers come from different nationalities and denominational backgrounds but work as a team. “Working together, I learned a lot and became more humble in the Lord,” said Lee. He attributes the daily growth of the church to God’s grace and guidance. He celebrates the congregation who have come to know Jesus and experience changed lives. Some have become leaders and are “very faithful sincere followers of Christ, serving God and God’s people, boldly sharing the Gospel message with other Hispanics in the streets,” said Lee. The ministry focuses on building relationships and venturing out into the community to do so such as at restaurants and public spaces. The church offers space for birthday parties, hosts community events with community leaders, actively seeks influential leaders and offers classes including English as a Second Language classes (ESL), sports, and music. The new faith community has gradually grown from 25 to 85 since its January launch. Rev. Hector Burgos, Director of Connectional Ministries, has supported the ministry by preaching messages on site. Pastors Heeyoung Lim and Minhwee Kang also support the ministry with their musical talents. “Whenever we see other people’s lives change, the Holy Spirit is touching them and working through them,” said Lee. “It’s my hope that this experience will give others some insight and ideas to start a new faith community or church within their church,” said Ryoo. FUMC of Ridgefield Park invites others to come experience and build the mission together by serving dinner on Sundays at their second campus. For more information, contact Pastor Michelle Ryoo at (201)213-6827 or Pastor Daniel Lee (201)290-3677.